The Historical Society of Plainfield will host a lecture entitled “Reclaiming Our Voice: New Jersey’s Central Role in the Fight for Woman Suffrage” on Sunday, March 24, 2019, starting at 2:00 PM at the Drake House Museum. 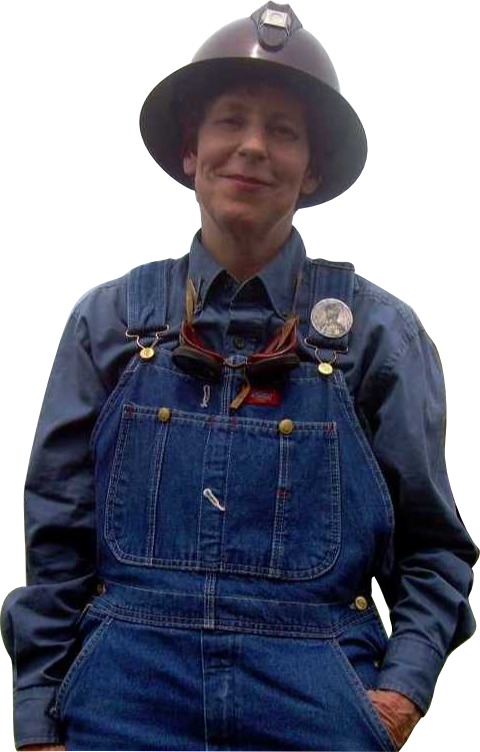 Carol Simon Levine will be portraying Lillian Feickert, president of the New Jersey Woman Suffrage Association from 1912-1920, who lived in Plainfield and North Plainfield. She will tell the story of the role of New Jersey women in the long struggle for woman suffrage. Two hundred and twenty-five years ago, women had the right to vote in only one state, New Jersey, a right they would lose in 1807, and not win back for more than five generations. New Jersey's role in the struggle to regain that right is largely overlooked. It is well-known that Elizabeth Cady Stanton proclaimed "all men and women are created equal" at the Women's Rights Convention of 1848 in Seneca Falls, NY. Few know that she lived in Tenafly in 1869, when she and Susan B. Anthony founded the National Woman Suffrage Association and wrote the first three volumes of their History of Woman Suffrage. 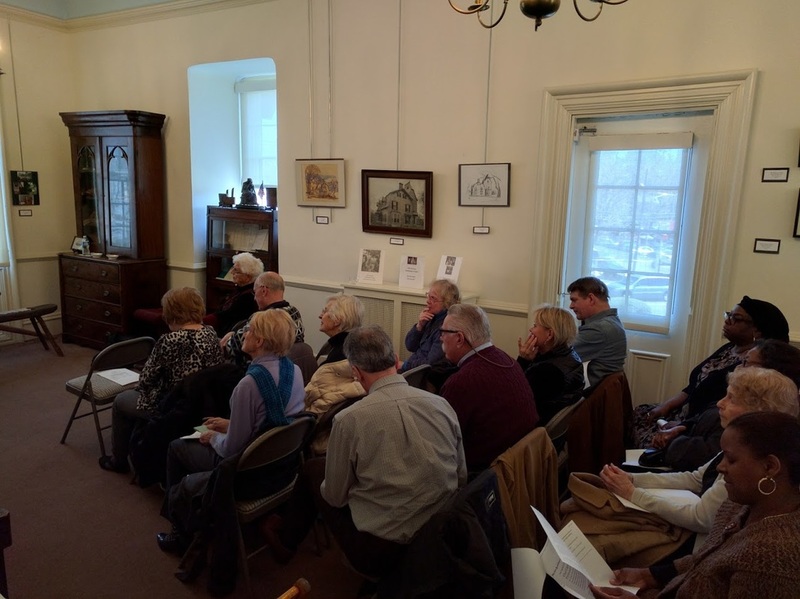 Few realize that Lucy Stone was a resident of South Orange in 1858, when she refused to pay taxes, stating "No Taxation Without Representation." She was still there in 1869, when she and her husband founded the American Woman Suffrage Organization. The previous year, Portia Gage and 171 other Vineland women (including four "colored" women) literally took suffrage into their own hands when they brought their own ballot box to the polls in order to cast their votes for president. Victoria Woodhull, the first woman to run for president, launched her candidacy in Vineland three years later. Hear the stories of these and many other women with Jersey ties -- including the Grimke sisters (who spoke out against slavery and for women's rights from their home in Shrewsbury), Dr. Florence Spearing Randolph (chair of the NJ Association of Colored Women's Clubs and executive board member on the NJ Woman Suffrage Association), Alice Low Turnbull Hopkins (who threw her considerable support behind Alice Paul's Washington pickets), and Alice Paul, the dynamo who re-energized the movement for a federal amendment. Together their tireless efforts propelled woman suffrage past reluctant male voters and through state and national legislatures to the final success of the 19th Amendment. Given by Susan Jerome, Collections Manager at the University of Rhode Island Textile and Costume Collection. Ms. Jerome will discuss some of the definitions and ideas surrounding the word “quilt.” How has the term evolved through time? 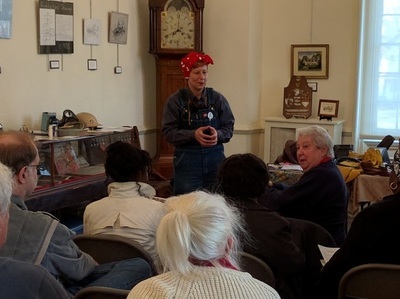 Learn about textile history and how technological changes in producing fabric influenced the production of quilts and the use of time during the 19th century. The audience is encouraged to bring one quilt or a quilted object with them for discussion. Susan Jerome earned her MS degree from University of Rhode Island Department of Textiles, Fashion Merchandising and Design. 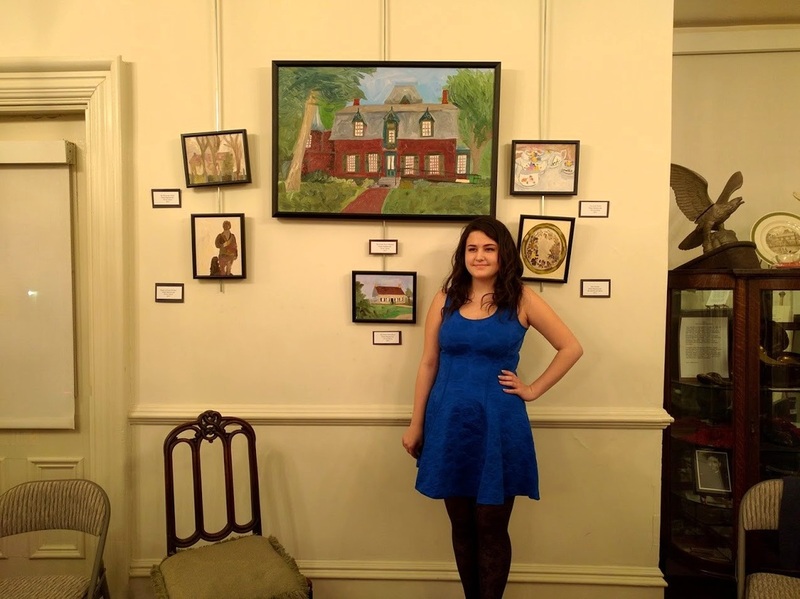 She is also a principal of CT Quilt Works, focusing on textile conservation and restoration. Prior to continuing her education, she worked for a number years at Mystic Seaport Museum. ​You are invited to attend a Tastefully Simple party on November 3rd at 2:00 pm. We are going to enjoy tasting different products, play some games, have fun and just hang out! Please feel free to bring a friend or two along, the more the merrier. Please let us know if you can make it by October 31, to ensure we prepare enough samples for everyone. You can RSVP by replying to this e-mail or by calling (908) 755-5831. If you are unable to attend, you may still purchase delicious Tastefully Simple products and support the Drake House by clicking here. 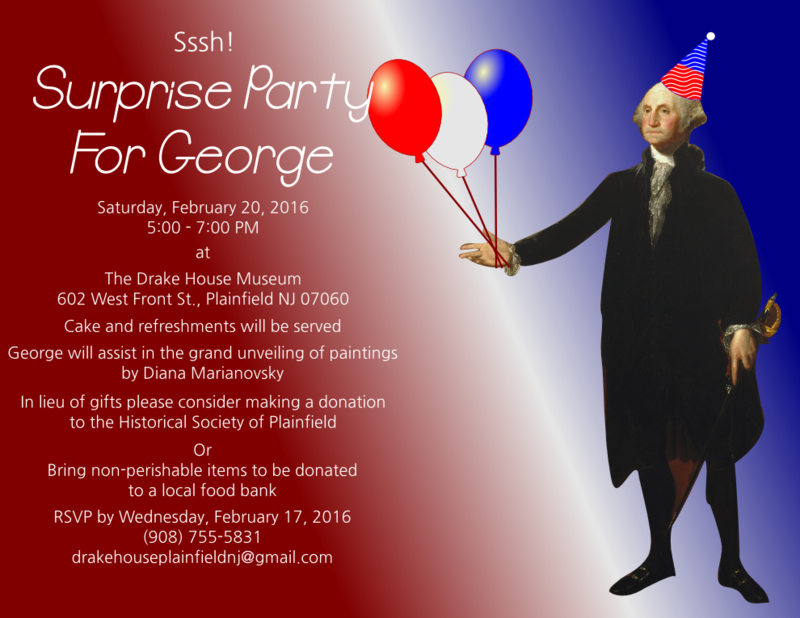 A portion of all sales go to support the Drake House Museum and the Historical Society of Plainfield. What is Tastefully Simple? The name says it all! Tastefully Simple features high-quality, signature flavors and ingredients that create a wow for you and make your time in the kitchen so much more enjoyable. ​Presented by storyteller/re-enactor Alisa Dupuy. 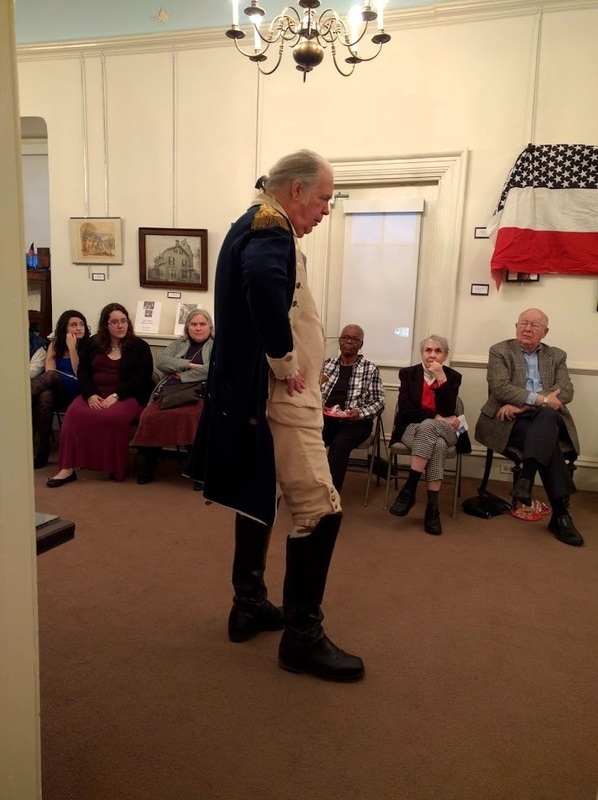 This history program is made possible in part by a 2018 HEART (History, Education, Arts Reaching Thousands) Grant from the Union County Board of Chosen Freeholders. Please join us at Houlihnas in Bridegwater, NJ from 5 pm-9 pm on October 22. Print the flyer below and bring it to have part of the cost of your meal go to the Drake House! 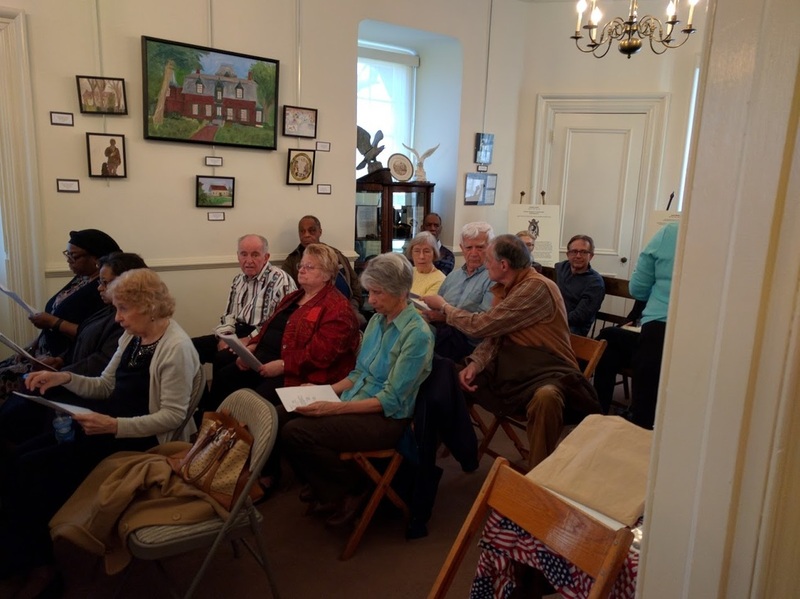 Special Program at the Drake House on Saturday, October 20, 2018 – “New Jersey Field Music Group” from Noon to 5 PM. 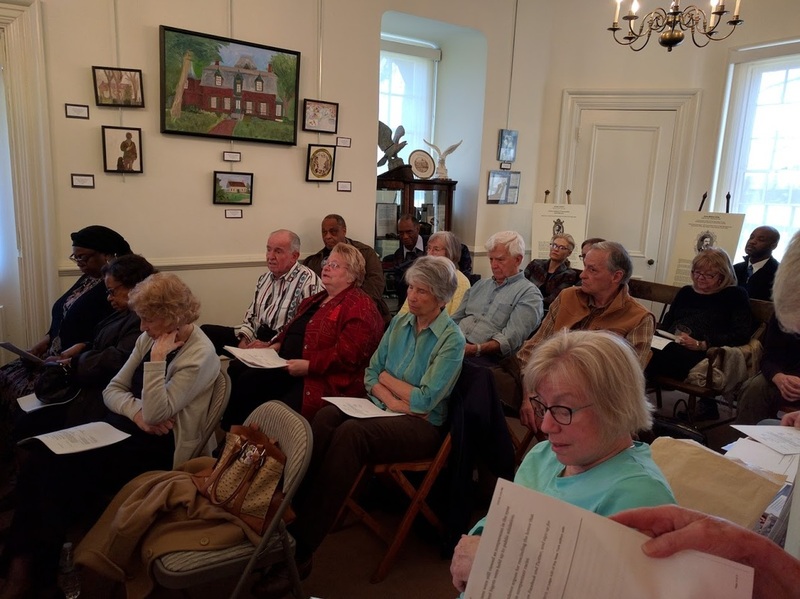 ​ This history program is made possible in part by a 2018 HEART (History, Education, Arts Reaching Thousands) Grant from the Union County Board of Chosen Freeholders. 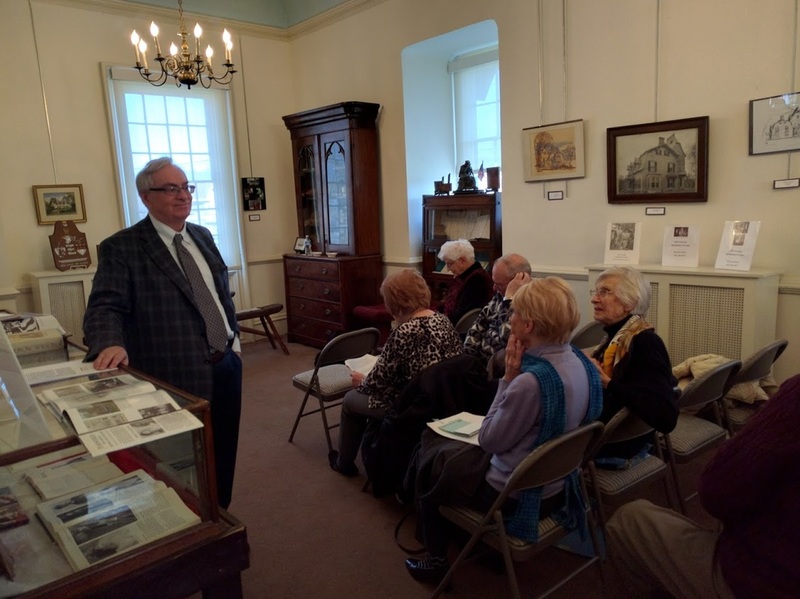 ​The Historical Society of Plainfield will host a lecture entitled “The Chain That Saved The Colonies” on Sunday, July 15, 2018, starting at 2:00 PM at the Drake House Museum. The lecture will given by Donald “Doc” Bayne. “Many New Jersey residents are not aware of the Great Chain that spanned the Hudson River at West Point during the American Revolutionary War. 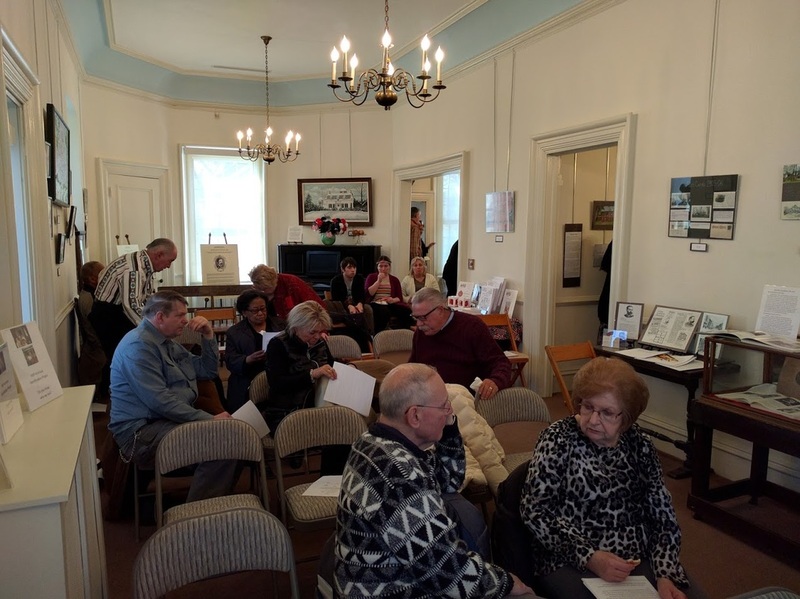 Doc Bayne has spent years researching the Great Chain and locating many of the remaining huge links of the hand-forged chain,” said Nancy Piwowar, President of the Historical Society of Plainfield. 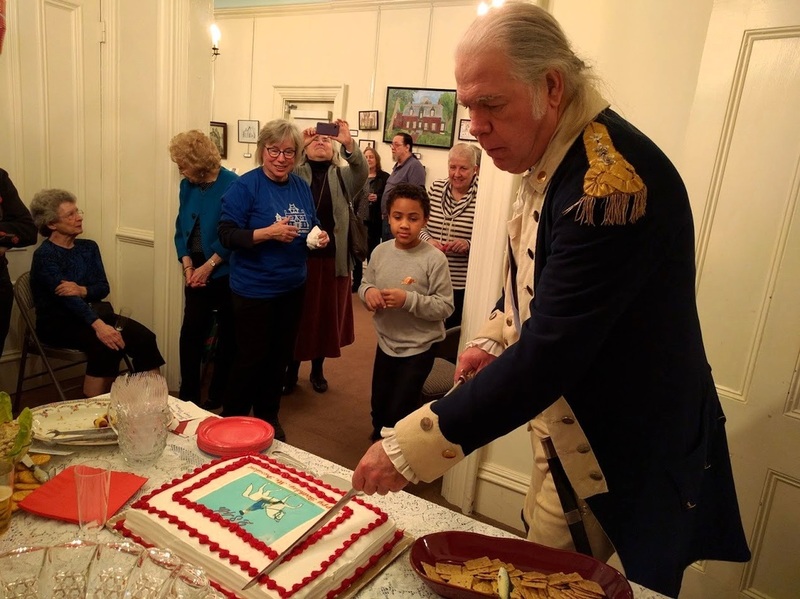 This is the story of one man’s quest to find the surviving links and to tell an amazing account of ingenuity, fortitude, and determination of the men of the Continental Army. 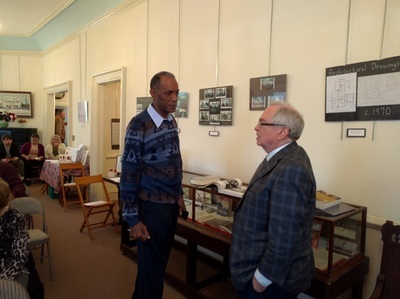 Donald “Doc” Bayne has been interested in history since the age of 8. He was drafted into the U.S. Army, and then became a commercial pilot. He worked for the Minolta Corporation, and later started a career with an audio visual company designing distance-learning classrooms for William Paterson University and U.M.D.N.J. as well as video conferencing systems for various companies at the World Trade Center. He then became a full-time Park Ranger, Environmental Educator and Historian at Sterling Forest State Park. He is now retired, and is on the Board of Directors of the Orange County Historical Society, the Board of the Fort Montgomery Battle Site, the Board of The Incorporated Orange County Chapter of the New York State Archaeological Association, the President of The Friends of Sterling Forest, and a member of the Greenwood Lake Historical Association. Seating is limited and is on a first-come first-serve basis. Light refreshments will be served. 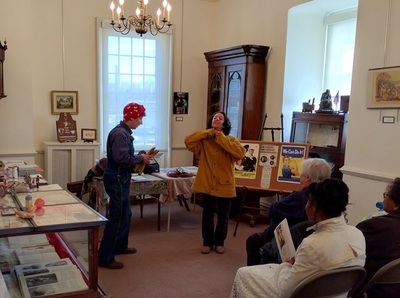 Program suggested donation is $5, and free to members of the Historical Society of Plainfield. Drake House Museum is air conditioned. The Historical Society of Plainfield Annual Members’ Meeting will be held on Sunday, June 24, 2018 from 1:30 p.m. to 4:30 p.m. The event will take place at The Drake House Museum. Presented by Ms. Leanne Manna, 2018 Kean University graduate. This lecture draws from a larger project that was the culmination of her work at Kean University. She explores the lives of the daughters of the first Governor of New Jersey, William Livingston. records as well as other records sets and strategies for studying groups to identify immigrant origins. and assists adoptee and others with unknown parentage. members: donations are always appreciated. 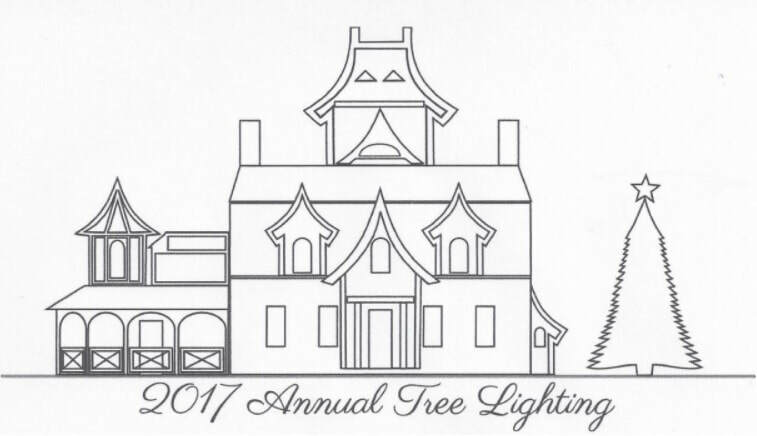 Due to the record number of visitor and safety concerns, the Historical Society of Plainfield is introducing timed entry ticket reservations for the Annual Tree Lighting. Timed tickets will help us make your visit more enjoyable, giving you the time and leisure to enjoy the event in a more relaxed environment. Please come to the Holiday Craft even on Sunday, December 3, 2017, starting at 2pm. Enjoy craft making, storytelling, and make reservations for the Annual Tree Lighting. Timed tickets are free and will be allocated on a first come, first served basis on Sunday, December 3, 2017, in person at the Drake House Museum. Tickets are limited and are only available in person. Only scheduled timed tickets will be allowed entry to the Annual Tree Lighting. Please plan on arriving approximately 5 minutes prior to your scheduled time. Each ticket group is allowed 30 minutes for the visit. ​This members only event features a reception and status updates on our organization which you so generously support. If you're not a member, visit the "support us" page on our website to join or sign up in person at the Drake House Museum. This year our meeting will be attended by two very special guests, George and Martha Washington, who will discuss their lives and answer any questions you might have about their experiences. 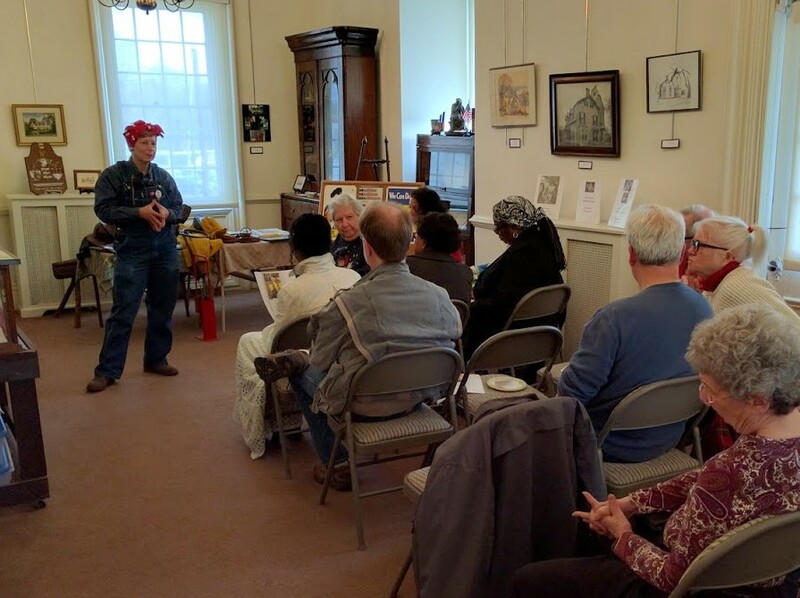 The Historical Society of Plainfield will be hosting a “Chat and Chew” and book signing with local author, Rikki Lyn Hauss. 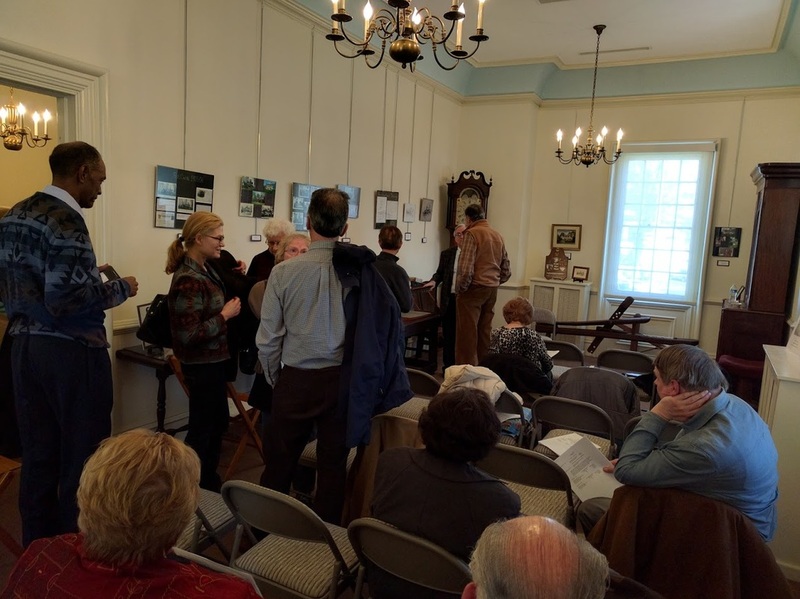 Her book discusses the life of New Jersey icon Doris Duke and recounts the efforts of local citizen volunteers who tried to save Ms. Duke’s favorite residence in Hillsborough NJ from demolition. Join us for an afternoon of remembering Ms. Doris Duke, who used her vast inheritance to contribute to society as an entrepreneur and philanthropist. Other members of DORIS (Demolition of the Residence is Senseless) will be in attendance. Refreshments will be served. Donations are always appreciated to support programming. Seating is limited and on a first-come first-served basis. Books will be available at $22.00 each. 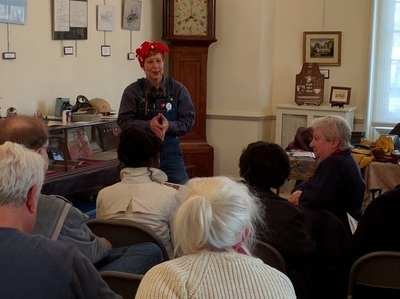 ​In honor of Women’s History Month, the Historical Society of Plainfield will be hosting a lecture and book signing given by Carol Simon Levin, author and story teller. 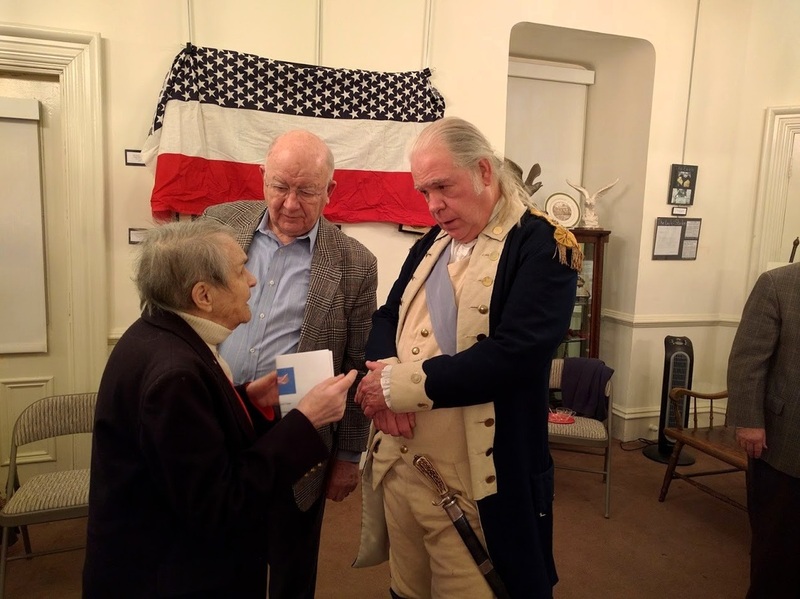 Levine will be portraying Abigail Adams who famously wrote to her husband, John, asking the Continental Congress to “remember the ladies” when drafting laws for the new nation. First lady Adams came to Plainfield in 1800, when she visited the troops at the Union Camp, and now her spirit will be making a return visit to Plainfield. Join us for an afternoon of remembering the ladies and all they have done and continue to do for our nation. Refreshments will be served. Members are free and non-members, donations are always appreciated. Seating is limited and on a first-come first-served basis. 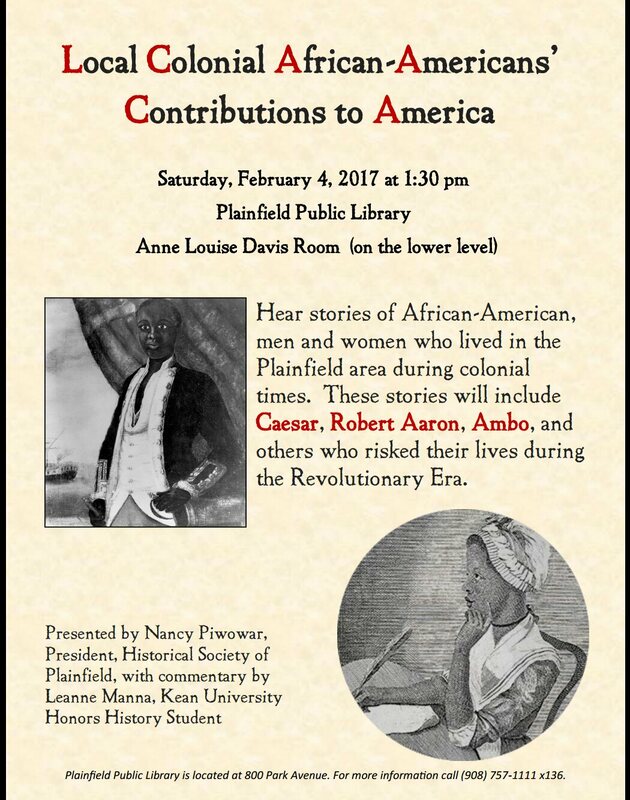 Presented by Nancy Piwowar, President of the Historical Society of Plainfield and Leanne Manna, Treasurer and Kean University History Honors student. Join us Sunday, Octob​er 30 at 2 for some local cemtery stories to get you in the mood for Halloween! 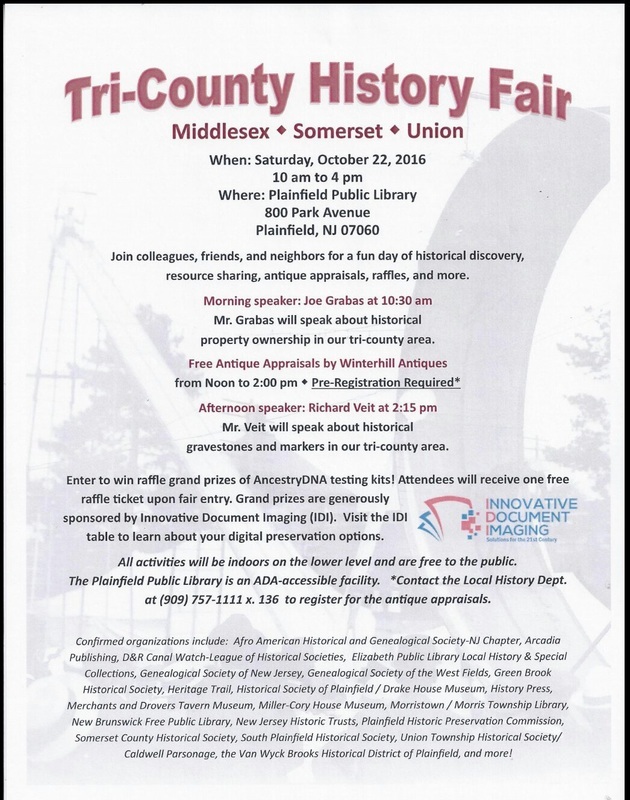 Join us for the Tri-County History Fair, Saturday October 22 from 10-4 at the Plainfield Public Library! For more information and events see the flyer below. Presented by Nancy Piwowar, President of the Historical Society of Plainfield. Hear stories about African-American men and women who lived in the Plainfield area during colonial times, including people such as Robert Aaron and Ambo, who risked their lives during the Revolutionary era. During the first hour of the 1.5 hour program, attendees learn the best ways to preserve their old photos, letter, scrapbooks, and other items typically found in boxes in the attic or basement. They also learn how and why to use archival quality materials. 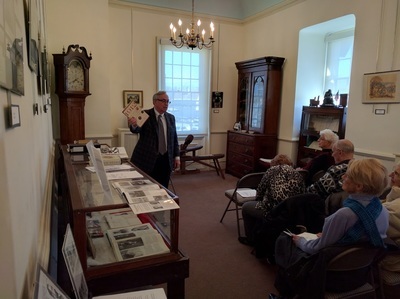 The last half hour of the program is dedicated to an interactive question and answer session during which attendees who bring in an item or two- a rare/old book, photo, letter, map, object- learn how to best keep their individual materials safe for future generations. If you are interested in attending this event, the flyer provided (PDF) must be presented the night of the event. Also, please RSVP by June 20, 2016 to drakehouseplainfieldnj@gmail.com. Hope to see you there! Ticket prices are: General Admission ­ $20.00; Seniors ­ $15.00; Student/Child­ $5.00. 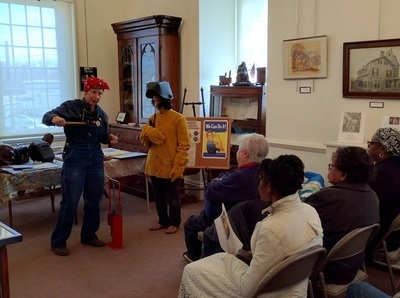 Tickets are available for purchase from the Historical Society Board of Trustees at 602 West Front Street Plainfield, NJ 07060, (908) 755­-5831. A portion of the proceeds of tickets purchased through the Historical Society will benefit the Drake House Museum and Society's mission. Program listed is tentative and subject to change. Ms. Bonnie Witzgall is a member of the Amateur Astronomers, Inc. (AAI), an amateur astronomy organization in Central New Jersey. 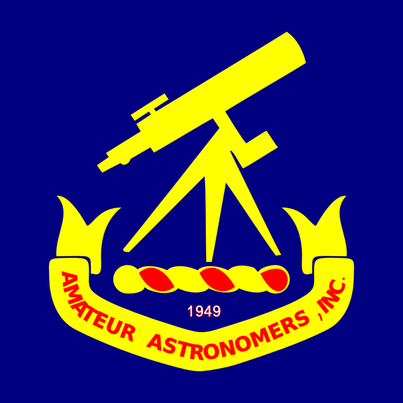 Founded in 1949, it currently has over 200 members, making it one of the largest astronomy clubs in the United States. The home of AAI is the William Miller Sperry Observatory on the campus of the Union County College in Cranford, New Jersey. The observatory houses two of the largest telescopes on the East Coast for amateur use. The East Dome holds a 10-inch f/15 refractor built by AAI members. The West Dome has a 24-inch f/11 Cassegrain reflector purchased by AAI. NOTE: Due to scheduling conflict, please note date change. Woodrow Wilson was the 13th President of Princeton University , the Governor of New Jersey and in 1912 was elected the 28th President of the United States. He served two full terms as US President, having won re-election in 1916. Historians generally recognize Wilson as one of the greatest US Presidents in terms of domestic reforms and global leadership.Recently, Princeton University students have challenged Wilson's legacy and recognition on the Princeton Campus, primarily due to his record on matters of Race. Cecilia Rouse, Dean of the Woodrow Wilson School of Public and International Affairs, has called Wilson's record on racial issues " disturbing". The Princeton University Board of Trustees is presently evaluating appropriate ways to respond to student and faculty objections to how Woodrow Wilson is recognized at Princeton University. On Sunday April 10th, the Plainfield Historical Society will conduct a discussion on " The Legacy of Woodrow Wilson: Good and Bad " from 2:00 PM to 4:00 PM at the historic Drake House Museum on West Front Street in Plainfield.The discussion will be led by long time Plainfield resident, Larry Bashe, former Plainfield City Administrator and retired investment banker. Mr. Bashe presently serves as an Adjunct Professor of History at Union County College in Cranford. This semester he is teaching a course on " The History of US Presidential Elections" at the Summit Community Center. The Public is invited to attend and participate in this discussion. In a dramatic presentation set in 1943, the Historical Society will be hosting a meeting to promote "war work" for women. 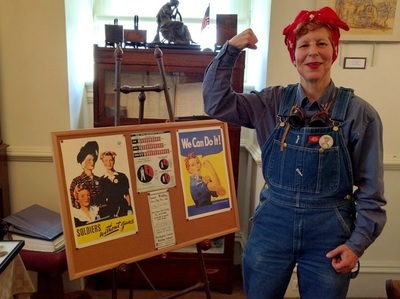 Come and hear a testimonial from Rosie Niemiec (historical interpreter Stacy Flora Roth) , a housewife who decided to do her bit for the war effort (and surprise her husband) by taking a job as a welder in a shipyard. 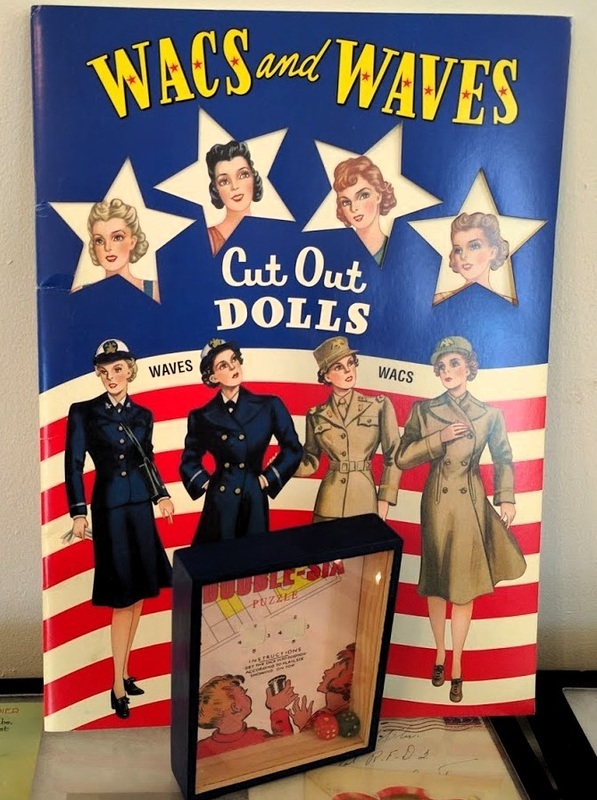 This unique presentation features a character monologue, a display of period artifacts and ephemera, and a discussion of women's participation on the home front. Members of the audience are invited to share memories, memorabilia, and personal and family stories of the WWII. 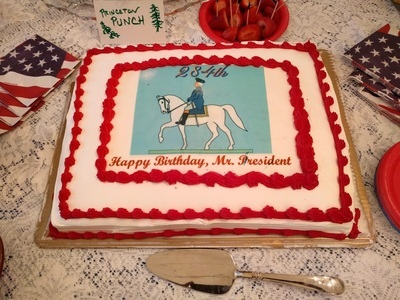 George Washington will return to Plainfield for his birthday celebration with the Historical Society of Plainfield. 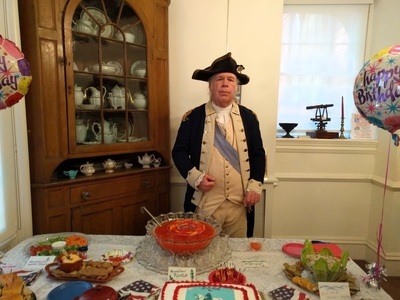 A reenactor portraying George Washington will mingle with guests at the affair, which will offer cake and refreshments. 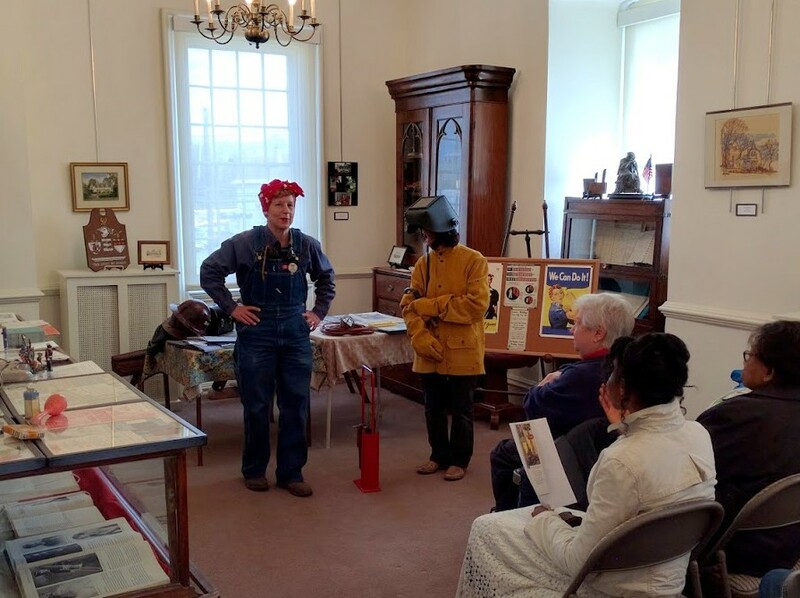 The event will also feature the unveiling of an oil portrait commissioned for the 270th anniversary of the Drake House in 2016, as well as the 95th anniversary of the Historical Society of Plainfield. Diana Marianovsky, a student at the School of Visual Arts in New York City, has also painted a series featuring the interior rooms of the Drake House. In lieu of gifts please consider making a donation to the Historical Society of Plainfield, or bring non-perishable items to be donated to a local food bank.